Balangir is a city and municipality in Balangir district in the state of Odisha, India. It is also the headquarters of Balangir district. Balangir has a rich cultural heritage. It is also known as the cultural hub of Western Odisha. Balangir city has many cultural groups who are trying hard to preserve the dying down Kosali folk arts and dance. Balangir municipality is divided into twenty one wards. Each ward consists of two three Units or sub-areas called "Pada" or "Para". Balangir city has nearly forty "Pada's". Some of the largest "Padas" of Balangir city are Rugudi Pada, Behera Pali Pada, Sud Pada, Maal Pada, Tikra Pada, Radharani Pada, Sagar Pada, Pratapsagar pada, Talpali Pada, Kandhpali, Adarsha pada, Anand Nagar, Alok Nagar, Jagannath Pada, Thikadar Pada, Palaceline, Gandhinagar Pada, Shanti Pada, Barpali Pada, Tulsinagar Pada, Kansari Pada, Teligoth Pada, Radharani para, Club para, Khadal para, Rameshwar nagar, Rajendra para, A.B.S.S. road etc. It is also home to the Ordnance Factory Balangir which is run by the Ordnance Factories Board Ministry of Defence, Government of India to manufacture various types of products for the Indian Armed Forces. It is spread over an area of 12,200 acres (4,900 ha). Balangir is located at 20.72°N 83.48°E﻿ / 20.72; 83.48. It has an average elevation of 383 metres (800 feet) above sea level. As of 2011 Census of India, Balangir had a population of 98,238. Males constitute 50,582 of the population and females 47,656. Communicative language of Balangir is Kosali and for education and official purpose English, Hindi and Odia are mostly used. Balangir's name is said to have been derived from Balaram Garh, a fort, built here in the 16th Century by Balram Deo, the 19th Raja of Balangir (Ex-Patna State) and founder of Sambalpur kingdom. Balangir was an obscure village till 1871 when the Court of Wards administration during the minority of the then ruler Ram Chandra Deo III shifted the capital from Patnagarh. Immediate steps were taken to build a planned township. Patnagarh, which was the capital of the Kingdom of Patna for several centuries was considered unsuitable to be the state headquarters because of its unhealthy climate. The moats and the bamboo thickets which had long protected the place against enemies became breeding ground of mosquitoes causing widespread malaria. The place was also not on the direct road from Bhawanipatna to Sambalpur. So, Balangir was selected to be the headquarters not only because of its climate but also for its admirable location on the route connecting the headquarters of Sambalpur with that of Kalahandi. The Plan of Balangir Town was prepared by Pandit Chintamani Bidyabhusan as a square town with roads crossing one another at right angles was accepted and the new township was constructed to the south of the old village. Sir Douglas, the then Deputy Commissioner of Sambalpur, got the sanction of the government and transferred the Headquarters from Patnagarh to the new town of Balangir in 1872. Old Balangir is now known as Junha Dihi meaning the old house site. Already in the 1871, the dispensary was built and some government offices moved to Balangir. The Court of Wards' administration lasted for 22 years, from 1871 to 1893 and during that period the jail building, the palace for the Maharaja and many office buildings were constructed. During the Kondh Rebellion of Kalahandi in 1882, the importance of Balangir increased as it became the main seat of operation against the rebellious Kondhs. After the setup of Balangir town, the dowager Rani Amrut Kumari built the temple of Gopalji, the earliest temple of the town and caused to be excavated a large tank which was named Pratap Sagar after her husband Maharaja Surpratap Deo. A contactor named Parbat Bira of Kutch built by the time a beautiful temple of God Narasimha. Balangir grew in size and grandeur during the rule of Maharaja Prithiviraj Singh Deo who established the High School, which was later known as Prithviraj High School (P R High School), a Sanskrit Tol, the George Literary Club and the fine temple of Samaleswari and Patneswari. The construction of the new palace building then known as Badal Mahal was undertaken by him about two miles to the south of the city by the side of the road leading to Titlagarh. It was later named as Sailashri Palace. Prior to this the royal palace was situated at the heart of the city and was known as Sheesh Mahal (currently known as Old Palace). During the administration of Maharaja Rajendra Narayan Singh Deo the city was beautified by laying out Rajendra Park and by the Rajendra Experimental Farm and construction of several fine buildings. The X-ray ward, the maternity ward and the Dairy farm were started and a Museum for preservation of antiquities was also organised. Balangir had its first college, Rajendra College Balangir in 1944. In 1962 the Women's College was started by member of parliament and Rajya Sabha member Sri Krushna Chandra Panda of Rugudi Para, who also established the Govt. Ayurvedic College, Town Boys High School and Town Girls High School amongst many other educational institute. The city is situated on the right bank of the Lakshmi, a hill-stream which flows in her rocky bed in serpentine course. The stream has been bridged at five places as the city is expanding on the left bank. There are hundred of temples in Balangir town. Each and every Pada has one or more temples. Following are some of the Most Popular and important temples of Balangir Town. Maa Pataneswari Temple (Pataneswari Gudi) - The presiding deity of Balangir District. Maa Samaleswari Temple (Samalei Gudi) - Second most visited Famous temple of Western Odisha after Samaleswari temple of Sambalpur. Dedicated to Maa Samalei. Gopaljee Temple - Oldest temple of Balangir town dedicated to Lord Krishna. Sheetala Mata Temple - located inside the premises of Santoshi Temple. Mausi Maa Teple - Dedicated to Lord Jagannath. Lord Jagannath stays at this temple during Rath Yatra. Durga Temple - Dedicated to Lord Durga. Ram Temple - Located near daily market is dedicated to Lord Ram, Seeta, Laxman and Hanuman. Laxmi Narayan Temple - One of the oldest temples dedicated to Lord Laxmi, located at Club Pada. There is Kandulbudha khala at Dangarpada village and temple at Antarla village of deogaon block. There are several churches in Balangir town. Prominent amongst them are Roman Catholic Church at Rugudi Pada and Protestant church at Adarsha Pada. Rasanara Parwin is a cricket player of India women's national cricket team. Harishankar: It is about 70 km away from Balangir, Lord Vishnu and Lord Shiva are being worshiped here. A yatra called Shiva Chaturdashi Mela is observed with hue which attracts visitors and devotees form across the country. Rajendra Park - Built by last king of Patna (princely state) HH. Rajendra Narayan Singh Deo is a 100-year-old park. This park is situated in the heart of Balangir City. It is a lush green park with hundred varieties of Roses and other flowers. The park has three beautiful water fountains which light up at evenings. Rajendra Park also have children playing areas and various amusements. It has got a cafeteria also. Besides that the park is equipped with Dolby Digital Sound System which plays old Hindi songs throughout the evening. In the middle of the park there is a statue of its founder HH Rajendra Narayan Singhdeo. The timing of the park is from afternoon 4 PM to evening 10 PM. Entry fee for this park is Rs.2, which is used for the maintenance. Rajendra Park is situated in front of the Balangir Municipality Office. Karanga Kata - One of the oldest lake of Western Odisha. Recently Balangir Municipality has renovated it and started Boating. Lush green garden has been built around the lake to make it beautiful. It is located behind the Durga Mandir. Anand Niketan, Khujenpali – There is a beautiful Ashram organised by Viswatma Chetana Parishad on 40 Acres of land surrounded by School Viswatma Vidya Mandir, Yoga Centre, Puja Mandap, Sadhana Kehtra, Ashutosh Peeth, Green Forest, Garden, Prajna Kutir, Santha Nivas etc. Every year nearly thousands visitors coming from around the world to see this spiritual place on various occasion like Sivaratri, Navaratri, Guru Purnima and for many Yoga and spiritual practices. The asharm is established from 1985 by Paramahamsa Swami Sri Satyaprajna Nanda Saraswati. Divine Life Society - Conducting Yoga classes from the last four decade. 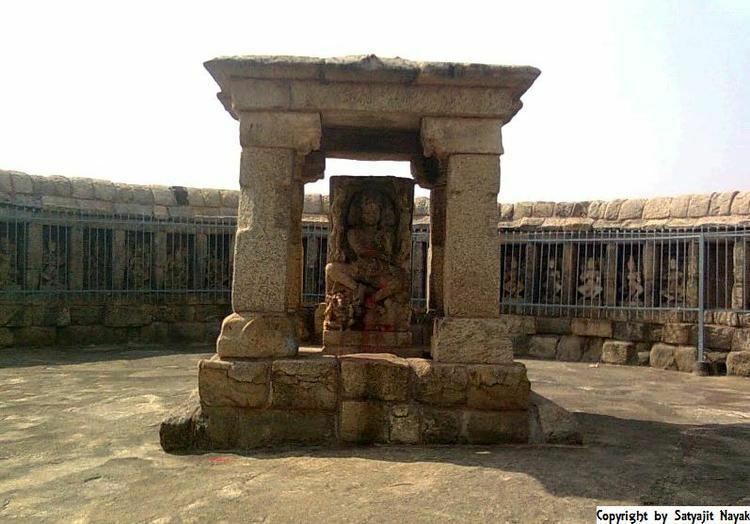 Location Gaura Mutt, Nalkhandi (Rugudi Pada). Khujenpali Ashram - If you are in search of real spirituality then this is a must visit place. 5 km from Balangir Town. Jalia - It's a popular picnic spot for the youths. It is located in the middle of dense forest. one small river also passed through the spot. Located around 20 km from Balangir. Ramai Talkies - It's a historical single screen movie theater. It is around 70 years old. Lower Sukhtel project - A popular picnic spot on the bank of Sukhtel River. Current construction work is underway for a proposed dam here. Located around 15 km from Balangir. 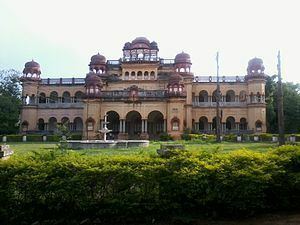 Sailashree Palace - A huge palace belonging to the Royal Family of Balangir. Agalpur (Raj) - The nature's beauty Agalpur (Raj) is a block of Balangir district. The "Rana Ghat" of Ang River at Agalpur (Raj) is most beautiful during the rainy days. Sagarpada Mahadev Mandir - Located in the sagarpada near Rugudipada. Tangreswar Shiva Mandir- Located in the manoharpur. Amu Farm - Built by private entrepreneurs which contains a numerous variety of plantation along with amu birds. The Nuagaon Airport is the nearest airport to the city while Swami Vivekananda Airport at Raipur, Chhattisgarh is 234 km away. Biju Patnaik International Airport in the state capital, Bhubaneswar is 327 km away by road and 397 km by rail. The upcoming airport in Jharsuguda is around 180 km from Balangir. Balangir Railway Station on the Jharsuguda-Sambalpur-Titlagarh railway line of South Eastern Railways is the city's railway link to the national railway network. A new 289 km long railway line from Bolangir to Khurda Road junction was sanctioned in 1993 and its foundation stone was laid in June 2001 but there has been very little progress in construction of this railway line. Out of 289 km length, 22 km is in Bolangir district. Even all the land required for the railway line has not been acquired until the end of 2011. Bolangir is connected by road to the state capital Bhubaneswar which is 327 km in the west. It is also connected to Cuttack, Rourkela, Dhenkanal and other important cities in Odisha. Current MLA from Bolangir Assembly Constituency is Narasingha Mishra of Indian National Congress, who won the seat in State elections of 2014 by defeating BJD stalwart Ananga Udaya Singh Deo. Bolangir is part of Bolangir (Lok Sabha constituency). There are several project continuing in bolangir district for the need of people in this region. Lower Suktel Irrigation Project is a major irrigation scheme, proposed across the river Suktel, a tributary of river Tel, a major right tributary of river Mahanadi in Odisha. The Environment Clearance to the project was given by the Ministry of Environment and Forest in 1998. The dam site is located around 20 km from the Bolangir town which will submerge more than 30 villages. The project work had been halted by the immense protests from ‘Lower Suktel Budi Ancahal Sangram Parishad’ (LSBASP) and its members. They were protesting against the displacement and inadequate compensation given to the land losers of the project. The project includes Construction of a 1410m long and 30m high Earthen Dam with a Spillway of 177m long, to be located centrally across the Suktel.There are two main Canals, the right main canal taking off from right dyke having a length of 23.84 km and the left main canal taking off from earth dam having a length of 10.76 km including the length of two of distributaries of about 35 km. The total command area of the Project is 31830 hector in 189 villages jointly in Bolangir and Sonepur District. On completion, the project will irrigate 29841 hector in Bolangir district spreading over 177 villages and 12 villages in Sonepur district. Further this project will supply 20 Cusecs of drinking water to Bolangir city. The project under implementation with Central loan assistance from Accelerated Irrigation Benefits Program (AIBP) under the Long Term Action Plan (LTAP) of K.B.K. region at an estimated cost of Rs. 217.13 Crores at 1994 Price level. The revised estimate of the project amounting to Rs.1041.81 Crores has been approved by the Central Water Commission (At 2009 Price Level) on 9 November 2010. The construction and development work is being operated by Odisha Construction Corporation Limited.